Ever have an aha moment about a topic you wished you were introduced to sooner, like childhood? Relationships are certainly one of those topics — it’s as if we are expected to know what to do in a marriage without any training and lucky ones or those who seek advice and seek it often find solace in great advice from mentors and friends along the way to get us through. Spirituality is also a topic most of us don’t talk about when we’re young — we simply don’t have the exposure and/or our parents are either glued to a religious dogma so are closed to the possibility that other ways of thinking about the universe (God and/or Gods) may exist. And, we certainly don’t talk about Spiritual Health. I had a spiritual health tune up recently from Northern California and San Francisco-based Amy Maloon. Amy does psychic readings, energy system readings, on-the-table healings, house clearings, acupuncture and more. Those who have had psychic readings done know that they can vary quite a bit from person to person, depending on their strength and their style. Her readings are focused on breaking through past and present blockages, which can stop us from the realization of our true selves. I experienced a reading with her (focused on the next chapter of my life), where she took a look at my chakras and overall body state. When I first arrived, we had tea (home grown apparently) and she started accessing information about my chakras and auras right away (with her eyes closed), me sitting in front of her. She also accessed information from a few of my past lives to see if there was any correlation between some of the blockages I’m now facing in this life. Amy feels energy and sees “pictures” (blockages in the form of images) around a current issue or question that you bring to the reading. She looks at the origin of these “pictures”, why you are choosing to continue to react to them, and whether you are ready to move these issues out. Amy doesn’t believe in simply doing a reading without at least some healing. An energetic healing helps to move energetic blocks, and create space for change. After assessing where I was blocked, we moved to the table, where she applied gemstones on each of my chakras and then inserted needles. I’m a huge fan of acupuncture so was thrilled that she incorporates it as part of her spiritual healing practice. She used all points that correspond with each of the chakras and then added The Four Gates (Large Intestine 4 & Liver 3) which I’ve experienced many times as part of an acupuncture treatment. She does this combination to direct and move the energy in the body called Qi to clear out each of the blocked chakras. Amy often uses these points and spiritual acupuncture points treatments called the 8 extraordinary channel acupuncture treatments with something she refers to as spiritual tune-ups. She feels that the acupuncture is a necessary part of the process, since it is needed to help heal body level soul trauma that keeps one from full enlightenment. Once the body heals, so too can the soul. She also used sprays, which are a combination of essential oils, water and intention and she has a meditation intention for each spray: clarity, love, grounding, refresh and original essence. We’ll be talking about the healing power of sound more and more on WBTW, but rest assured, we’re huge believers in the power of sound. 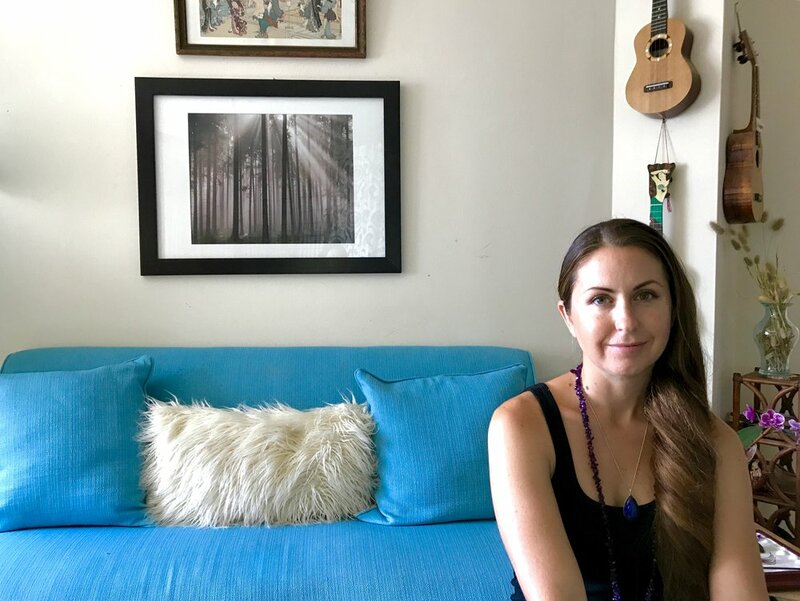 Amy uses tuning forks and singing bowls as a way to change your vibrational energy to essentially a “healing one”, so it’s more in tune to heal. The power of sound from tuning forks and singing bowls aligns your body‘s frequency so it’s better able to accept the healing taking place. Once the sound was in motion, I found myself drifting off into another world, almost in a lucid dreaming state. After I was zoned out (almost), Amy did some Reiki on some parts of my body. I’m a gemstone goddess myself, so I am always curious why one gemstone is used over another because I find that practitioners’ choices are more random than you’d expected. While there are certainly resources and gurus who will tell you that one gemstone is a savior for one thing or another, the truth is that gemstones are very intuitive and favorite “go to’s” often differ from person to person. That said, rose quartz, crystals and amethyst are almost always used in general healings. Amy used onyx and obsidian on my lower chakras, tiger’s eye for my third chakra, rose quartz for the heart and amethyst for the crown. She put a clear opal on my forehead and one of my favorites, lapis, for the fifth chakra. Amy asserts that our healthiest “self” is an energetic body that is only full of its own energy and not energy from other places, people or sources. It’s also important that our heart is fully “there” — in other words, present. With one statement, we can manipulate energy — think and intend it and so it is. Energy can be made in many different forms and there are many things we can do to shift a negative energy from the air or from ourselves. Let’s face it — no one teaches us about our spiritual health, energy or our chakras. But, the truth is, cleaning out the emotional baggage through spiritual healing and getting regular tune ups are as important as going to the dentist for a clean a few times a year. So, how did I feel afterwards? Like putty really, as if I were floating on a star and needed a hammock. Where’s my cup of tea please? It’s hard for me to get to a state of pure relaxation and this state is necessary for the body to listen to what it needs to do and to take care of itself, with a l’il intention work of course. I also felt much more open and am convinced that regular spiritual tune ups are not only a healthy thing to do, but a necessary thing to do. For all of us.